This walkthrough shows you how to perform several common data science tasks with the Linux Data Science VM. The Linux Data Science Virtual Machine (DSVM) is a virtual machine image available on Azure that is pre-installed with a collection of tools commonly used for data analytics and machine learning. The key software components are itemized in the Provision the Linux Data Science Virtual Machine topic. The VM image makes it easy to get started doing data science in minutes, without having to install and configure each of the tools individually. You can easily scale up the VM, if needed, and stop it when not in use. So this resource is both elastic and cost-efficient. The data science tasks demonstrated in this walkthrough follow the steps outlined in the Team Data Science Process. This process provides a systematic approach to data science that enables teams of data scientists to effectively collaborate over the lifecycle of building intelligent applications. The data science process also provides an iterative framework for data science that can be followed by an individual. We analyze the spambase dataset in this walkthrough. This is a set of emails that are marked as either spam or ham (meaning they are not spam), and also contains some statistics on the content of the emails. The statistics included are discussed in the next but one section. An Azure subscription. If you do not already have one, see Create your free Azure account today. A Linux data science VM. For information on provisioning this VM, see Provision the Linux Data Science Virtual Machine. X2Go installed on your computer and opened an XFCE session. For information on installing and configuring an X2Go client, see Installing and configuring X2Go client. For a smoother scrolling experience, toggle the gfx.xrender.enabled flag in about:config in VMs FireFox browser. See more here.. Also consider toggling mousewheel.enable_pixel_scrolling to False. Instructions here. An AzureML account. If you don't already have one, sign up for new one at the AzureML homepage. There is a free usage tier to help you get started. The spambase dataset is a relatively small set of data that contains only 4601 examples. This is a convenient size to use when demonstrating that some of the key features of the Data Science VM as it keeps the resource requirements modest. This walkthrough was created on a D2 v2-sized Linux Data Science Virtual Machine (CentOS Edition). This size DSVM is capable of handling the procedures in this walkthrough. If you need more storage space, you can create additional disks and attach them to your VM. These disks use persistent Azure storage, so their data is preserved even when the server is reprovisioned due to resizing or is shut down. To add a disk and attach it to your VM, follow the instructions in Add a disk to a Linux VM. These steps use the Azure Command-Line Interface (Azure CLI), which is already installed on the DSVM. So these procedures can be done entirely from the VM itself. Another option to increase storage is to use Azure files. Columns like word_freq_WORD indicate the percentage of words in the email that match WORD. For example, if word_freq_make is 1, then 1% of all words in the email were make. Columns like char_freq_CHAR indicate the percentage of all characters in the email that were CHAR. capital_run_length_longest is the longest length of a sequence of capital letters. capital_run_length_average is the average length of all sequences of capital letters. capital_run_length_total is the total length of all sequences of capital letters. spam indicates whether the email was considered spam or not (1 = spam, 0 = not spam). Let's examine the data and do some basic machine learning with R. The Data Science VM comes with Microsoft R Open pre-installed. The multithreaded math libraries in this version of R offer better performance than various single-threaded versions. Microsoft R Open also provides reproducibility by using a snapshot of the CRAN package repository. Open a terminal window and start a new R session with the R interactive console or use RStudio preinstalled on the machine. This shows you the type of each variable and the first few values in the dataset. These examples should enable you to make similar plots of the other columns to explore the data contained in them. Now let's train a couple of machine learning models to classify the emails in the dataset as containing either span or ham. We train a decision tree model and a random forest model in this section and then test their accuracy of their predictions. The rpart (Recursive Partitioning and Regression Trees) package used in the following code is already installed on the Data Science VM. And then create a decision tree to classify the emails. Let's also try a random forest model. Random forests train a multitude of decision trees and output a class that is the mode of the classifications from all of the individual decision trees. They provide a more powerful machine learning approach as they correct for the tendency of a decision tree model to overfit a training dataset. Azure Machine Learning Studio is a cloud service that makes it easy to build and deploy predictive analytics models. One of the nice features of Azure Machine Learning studio is its ability to publish any R function as a web service. 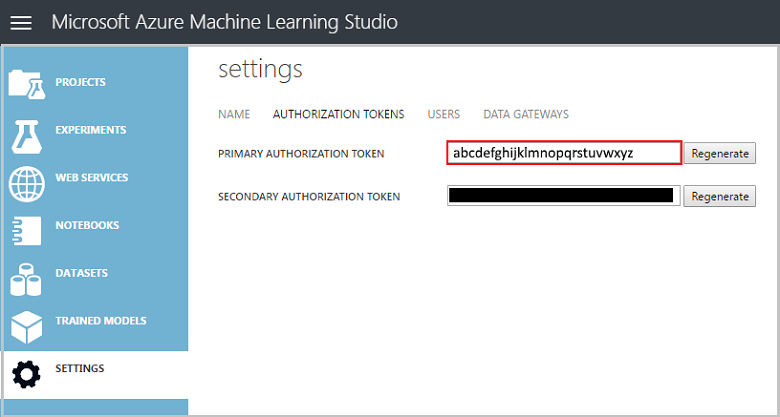 The Azure Machine Learning studio R package makes deployment easy to do right from our R session on the DSVM. Select Settings on the left-hand menu. Note your WORKSPACE ID. Select Authorization Tokens from the overhead menu and note your Primary Authorization Token. This function takes the predictSpam function, creates a web service named spamWebService with defined inputs and outputs, and returns information about the new endpoint. XGBoost is a tool that provides a fast and accurate boosted tree implementation. XGBoost can also call from python or a command line. For development using Python, the Anaconda Python distributions 2.7 and 3.5 have been installed in the DSVM. The Anaconda distribution includes Conda, which can be used to create custom environments for Python that have different versions and/or packages installed in them. To show how to publish an AzureML endpoint, let's make a simpler model the three variables as we did when we published the R model previously. # Get some info about the resulting model. This is only available for python 2.7 and is not yet supported on 3.5. Run with /anaconda/bin/python2.7. The Anaconda distribution in the DSVM comes with a Jupyter notebook, a cross-platform environment to share Python, R, or Julia code and analysis. The Jupyter notebook is accessed through JupyterHub. You sign in using your local Linux user name and password at https://<VM DNS name or IP Address>:8000/. All configuration files for JupyterHub are found in directory /etc/jupyterhub. See the IntroToJupyterPython.ipynb for a sample Python notebook. See IntroTutorialinR for a sample R notebook. See the IrisClassifierPyMLWebService for another sample Python notebook. The Julia language is also available from the command line on the Linux Data Science VM. Rattle (the R Analytical Tool To Learn Easily) is a graphical R tool for data mining. It has an intuitive interface that makes it easy to load, explore, and transform data and build and evaluate models. The article Rattle: A Data Mining GUI for R provides a walkthrough that demonstrates its features. Installation is not required on the DSVM. But Rattle may prompt you to install additional packages when it loads. Rattle uses a tab-based interface. Most of the tabs correspond to steps in the Data Science Process, like loading data or exploring it. The data science process flows from left to right through the tabs. But the last tab contains a log of the R commands run by Rattle. Choose the selector next to Filename and choose spambaseHeaders.data. To load the file. select Execute in the top row of buttons. You should see a summary of each column, including its identified data type, whether it's an input, a target, or other type of variable, and the number of unique values. Rattle has correctly identified the spam column as the target. Select the spam column, then set the Target Data Type to Categoric. Click Summary, then Execute, to see some information about the variable types and some summary statistics. To view other types of statistics about each variable, select other options like Describe or Basics. Check Histogram for word_freq_remove and word_freq_you. Select Execute. You should see both density plots in a single graph window, where it is clear that the word "you" appears much more frequently in emails than "remove". Rattle warns you that it recommends a maximum of 40 variables. Select Yes to view the plot. There are some interesting correlations that come up: "technology" is strongly correlated to "HP" and "labs", for example. It is also strongly correlated to "650", because the area code of the dataset donors is 650. The numeric values for the correlations between words are available in the Explore window. It is interesting to note, for example, that "technology" is negatively correlated with "your" and "money". Rattle can transform the dataset to handle some common issues. For example, it allows you to rescale features, impute missing values, handle outliers, and remove variables or observations with missing data. Rattle can also identify association rules between observations and/or variables. These tabs are out of scope for this introductory walkthrough. Then go back to the Cluster tab, choose KMeans, and set the Number of clusters to 4. Then Execute. The results are displayed in the output window. One cluster has high frequency of "george" and "hp" and is probably a legitimate business email. Choose Tree as the Type. Select Execute to display the tree in text form in the output window. Select the Draw button to view a graphical version. 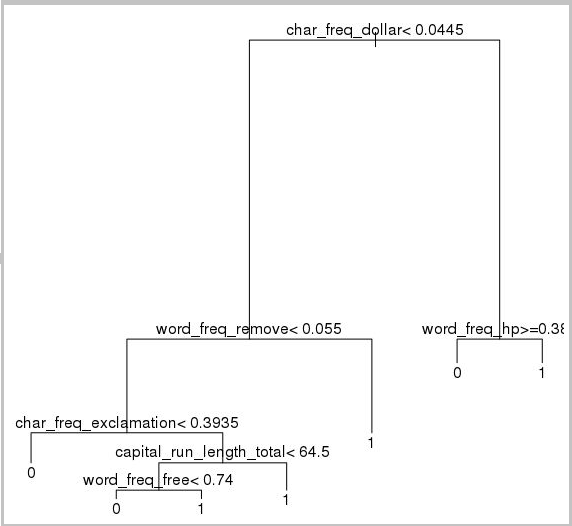 This looks quite similar to the tree we obtained earlier using rpart. Choose All for the Type. After it finishes you can click any single Type, like SVM, and view the results. You can also compare the performance of the models on the validation set using the Evaluate tab. For example, the Error Matrix selection shows you the confusion matrix, overall error, and averaged class error for each model on the validation set. You can also plot ROC curves, perform sensitivity analysis, and do other types of model evaluations. Once you're finished building models, select the Log tab to view the R code run by Rattle during your session. You can select the Export button to save it. There is a bug in current release of Rattle. To modify the script or use it to repeat your steps later, you must insert a # character in front of Export this log ... in the text of the log. The DSVM comes with PostgreSQL installed. PostgreSQL is a sophisticated, open-source relational database. This section shows how to load our spam dataset into PostgreSQL and then query it. Now, let's explore the data and run some queries using Squirrel SQL, a graphical tool that lets you interact with databases via a JDBC driver. Select Windows, then View Drivers. Right-click on PostgreSQL and select Modify Driver. Select Extra Class Path, then Add. Choose List Drivers, then select org.postgresql.Driver in Class Name, and select OK. Select Windows, then View Aliases. Choose the + button to make a new alias. Name it Spam database, choose PostgreSQL in the Driver drop-down. Set the URL to jdbc:postgresql://localhost/spam. To open the Connection window, double-click the Spam database alias. Enter a simple query such as SELECT * from data; in the query textbox at the top of the SQL tab. Press Ctrl-Enter to run it. By default Squirrel SQL returns the first 100 rows from your query. There are many more queries you could run to explore this data. For example, how does the frequency of the word make differ between spam and ham? Or what are the characteristics of email that frequently contain 3d? Most emails that have a high occurrence of 3d are apparently spam, so it could be a useful feature for building a predictive model to classify the emails. If you wanted to perform machine learning with data stored in a PostgreSQL database, consider using MADlib. Azure SQL Data Warehouse is a cloud-based, scale-out database capable of processing massive volumes of data, both relational and non-relational. For more information, see What is Azure SQL Data Warehouse? bcp spam in spambaseHeaders.data -q -c -t  ',' -S <server-name>.database.windows.net -d <database-name> -U <username> -P <password> -F 1 -r "\r\n"
The line endings in the downloaded file are Windows-style, but bcp expects UNIX-style, so we need to tell bcp that with the -r flag. You could also query with Squirrel SQL. Follow similar steps for PostgreSQL, using the Microsoft MSSQL Server JDBC Driver, which can be found in /usr/share/java/jdbcdrivers/sqljdbc42.jar. For an overview of topics that walk you through the tasks that comprise the Data Science process in Azure, see Team Data Science Process. For a description of other end-to-end walkthroughs that demonstrate the steps in the Team Data Science Process for specific scenarios, see Team Data Science Process walkthroughs. The walkthroughs also illustrate how to combine cloud and on-premises tools and services into a workflow or pipeline to create an intelligent application.